Lately I’ve been watching the adventures of Molly, a barn owl, via live video streaming on the Internet. (see http://www.ustream.tv/theowlbox) Two warnings before you check it out… 1. Owls are carnivores. I’ve watched her feed a rat to her babies…not for the squeamish. 2. It’s addictive! Some viewers have spent months watching these owls. 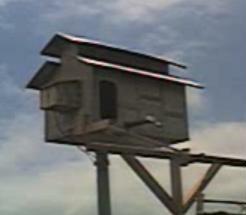 A California couple erected an ‘owl box’ in their backyard and installed a number of video cameras inside and outside. 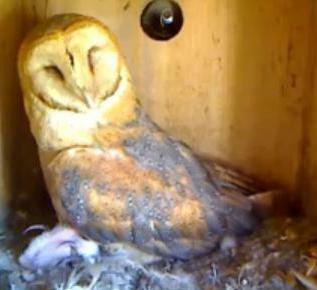 Within two weeks, a pair of barn owls, nicknamed Molly and McGee, took ownership of the new ‘digs’. They have already hatched one set of eggs (called a clutch), and are working on the second. Their adventures are streamed online, and their popularity has spawned songs, books, videos, and a line of assorted gifts. At this writing, three of Molly’s most recent eggs have hatched, and we’re waiting for the fourth. I say ‘we’ because Molly has attracted thousands of fans (called MODs — Molly Obsessive Disorder) from all over the world, who chat while watching the live stream. It was quite a celebration recently when we watched hatchling #3, named Kelly, make her way out of the egg. Every evening Molly (and her audience) waits for a visit from McGee, who is living out of the box with the first clutch, teaching them to hunt. She places her food order with loud squawks, and sooner or later (usually later) he shows up with some tasty treat — a rat or mole or gopher — to feed his family. Molly shares the meal with her new hatchlings, then returns to the work of sitting on the remaining egg. This is real life, not scripted or contrived. God created these beautiful creatures. It is enthralling to watch the simplicity and complexity of their lives. The fact that thousands of people are attracted to this site speaks of its appeal. It’s pretty simple. Their needs are basic. They hunt, they eat, they sleep, they care for their young. Molly is a devoted mother who is dependent on her mate to provide food for the family. (Owls are monogamous) McGee is a devoted father, who is training his young brood and taking care of his spouse. Like us, they depend on God, and He provides them with all they need to survive and thrive. Watching the owls is a good reminder of that fact. Okay, God. I’m trusting You for all I need. But I’m glad I don’t have to eat rats.